The extreme volatility of the stock market is not at this point going to reflect in our forecasting. Oil price and energy costs are are dropping which is a positive for our moderate to better stores. Banks are stable, big corporations are not going bankrupt, and the economic forecast for US GDP remains between 2.5 and 3.1 for the balance of 2015 and 2016. High end stores sometimes reflect the stock market, however the upper 1% of wealthy investors have found other lucrative and alternative options to invest their money, so the percentage of investments in equities for growth may not be the same as they have been in the past. Knomea, the world’s largest repository of economic data has US GDP pegged at 3.1. The Wall Street Journal is at 2.7 for Q3, and 2.8 for Q4 of 2015. 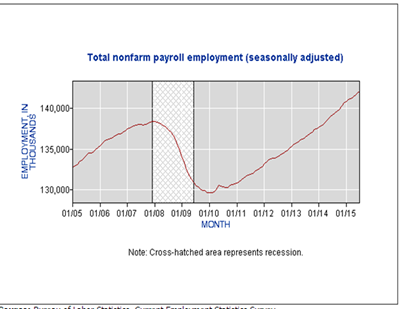 Also Non Farm Payroll continues to rise. See charts below. We also have leading indicators that historically are 6-8 months in front of our trends, and they do not reflect a need to change direction. The only weak month for Management One™ stores for 2015 was May, the other 6 months were all strong and in every month he number of stores reporting increases was in the high 70’s as a percent. This represents a very large cross section of the Western Hemisphere; Eastern, Central and Western Canada, multiple countries in Latin and South America. Our data points in the United States are significant, from small town America to the largest metropolitan areas in the country. (And this is one reason why we have gone to such a great extent to profile in Retail ORBIT™ and why the setups you are sending in are so critical). - Leave otb dollars open where you can. - Feed critical and signature classes. - Look at the 06/30/2014, 12/31/2014, and 06/30/2015 Balance sheet. Look for changes in inventory, cash and liabilities both current and long term. If you need help here let me know. - Cancel late shipments or get discounts. Late deliveries always impact cash flow negatively. - Stay aggressive with marketing. - Monitor customer conversion rates. If they do not have traffic counters, they should. - Use the tools we have created. - Focus on what can be controlled. For clients on Retail ORBIT™ please have them update their mtd to numbers at least weekly so we can spot trends faster. We now monitor this daily. If we see business start to slow we will react.